Trying to use your dealership’s website for both prime and subprime? See your leads and sales accelerate by having a website designed specifically for your subprime customer. Sub-prime customers shop online just like prime customers. Take advantage of this market segment by giving them the information and buying experience they are looking for. Most dealerships only have one website which is marketed and designed towards the prime buyer. Yet, many dealerships sell vehicles to both prime and subprime customers. 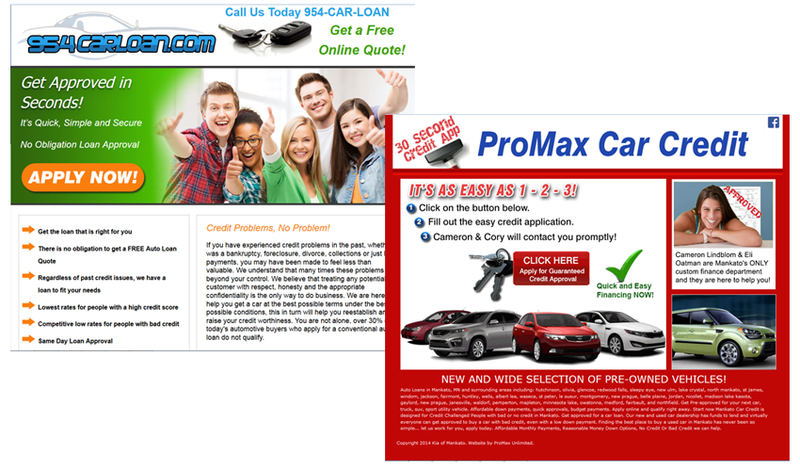 We can custom design a microsite for your dealership that will allow you to market directly to the subprime customer. Whether through traditional marketing or digital marketing you will be able to drive subprime customers to a website built 100% for them. Customers will be able to fill out a full credit application, get prequalified (if you choose), and receive or provide any information you request. The whole process is quick and easy… and isn’t that what everybody wants now days? With a microsite for your subprime customers you can now excel online with both your prime and subprime customers.